Unique energy efficient pool home on Lake Jackson. Features wood beam ceilings, versatile floor plan with lake views from every room. Main living area is open to the lake view the minute you enter the foyer. Living room overlooks the pool & lake. Oversized dining room - great for entertaining. Large kitchen with granite counter tops & cherry cabinetry. Family room opens to two-car carport. Downstairs includes bedroom wing with master bedroom & bath plus 2 additional bedrooms & hall bathroom. Upstairs with two bedrooms, full bath & long balcony. Fenced backyard, pool & entertainment deck, detached garage/workshop. Covered dock with power boat lift. Very energy efficient with 5k solar system, solar hot water, double paned prairie style windows - less than $250/mo electric for over 3,000 square feet under air. 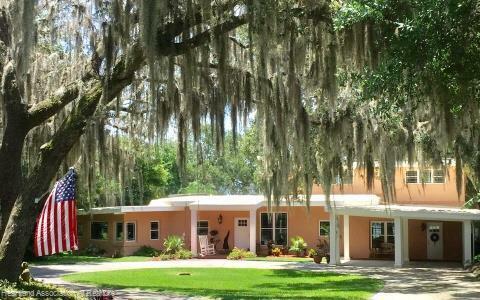 Southern feel with huge Live Oak Trees.